A delicious green goddess wedge salad, topped with bacon, blue cheese crumbles and cherry tomatoes and homemade green goddess dressing with Greek yogurt. The first time I had a wedge salad was a few summers ago on my birthday. Mr. B. and I made a day of it and went to the Shedd Aquarium and then to the Melting Pot for dinner. The Melting Pot used to have a themed dinner that had a specially selected cheese fondue, salad, meat selection and chocolate fondue based on the time of year. That was what we chose to eat and a beautiful and delicious wedge salad was part of that. I had never eaten a wedge salad before because to me it was just a hunk of lettuce with some dressing thrown on. Now that I look back I realize I was sorely missing out on the blue cheesy bacon-y goodness with a crunchy chunk of iceberg. 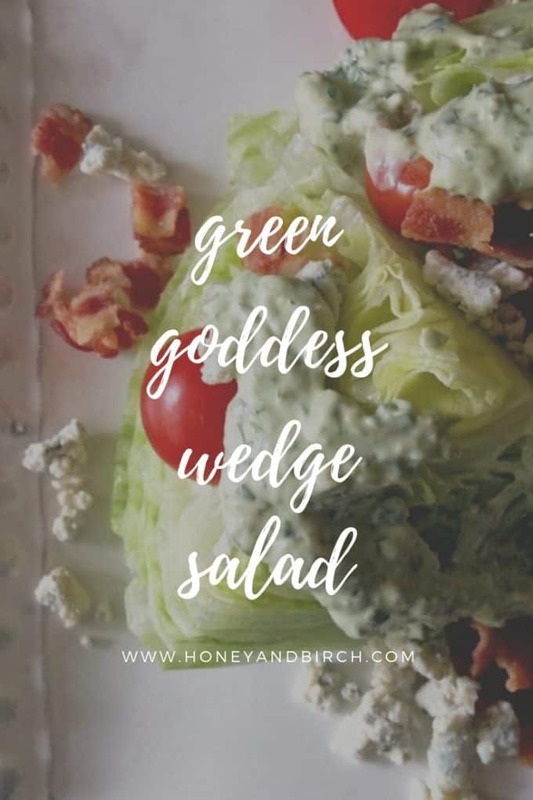 Typically wedge salads are served with blue cheese dressing, but for my salad here on Honey and Birch, I wanted to do something different. I came across this really different dressing – the green goddess. According to my research, before ranch dressing it was the most popular dressing on the West Coast. And my green goddess wedge salad was born. Green goddess dressing, in many ways, reminds me of caesar dressing thanks to the anchovy fillets. They may seem a little gross, but don’t skimp on them. It really makes the difference between a good salad dressing and a bad one. In addition to that are all the “green” herbs – parsley, green onion, tarragon and chives. I just love mixing this salad up because it smells herby and wonderful. Place Greek yogurt, mayonnaise, Worcestershire sauce, lemon juice, anchovies and garlic in a food processor. Process until smooth. Add parsley, green onions, tarragon and chives and process until minced. Cut a chunk of iceberg lettuce from the head of lettuce. 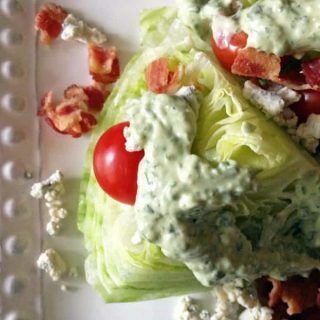 Sprinkle tomatoes, bacon, blue cheese and dressing over the wedge of lettuce. 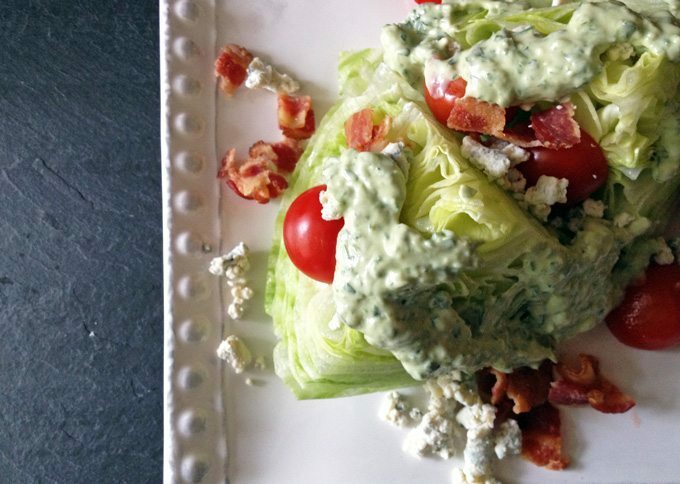 I have to say this was so enjoyable to eat – I just love the crunchiness of a wedge salad. I could eat one every day. Before you cook your bacon, check out this awesome bacon cooking tutorial from Cucina Kristina. 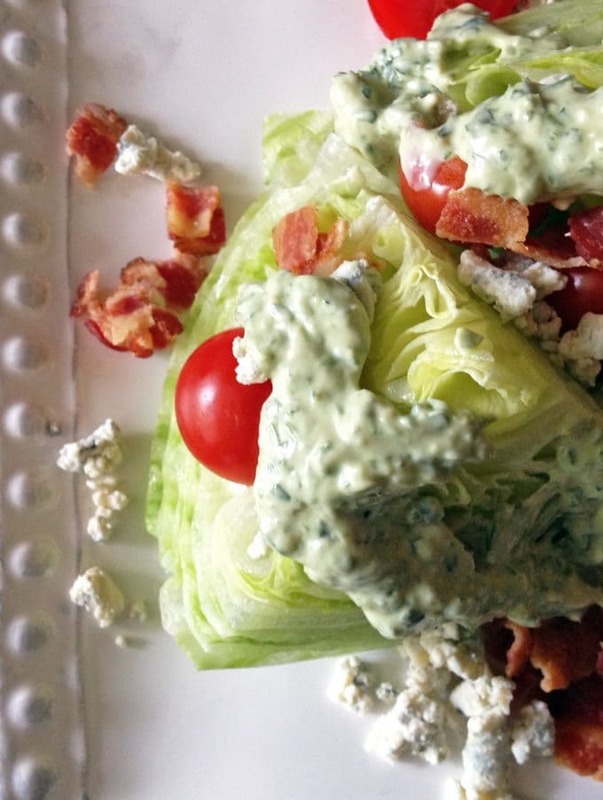 I am a huge fan of Wedge Salads, and your Green Goddess looks heavenly! Looks like tomorrow’s lunch to me! I love green goddess dressing – it’s a staple in my household. I usually use anchovy paste but experimented with fresh anchovies with your recipe for the first time and loved it. I added some arugula too. So good – everything was divine. Thanks for sharing. So glad to hear you liked it Rachel! Love green goddess dressing! So glad that Spring and fresh salads are on the horizon right now. Have a great Monday! This salad loos so delicious, pinning it! Mmm! I haven’t had green goddess dressing in quite a while. Thanks for sharing on the Creative K Kids Tasty Tuesdays Linky Party. I hope you will join us again next week. 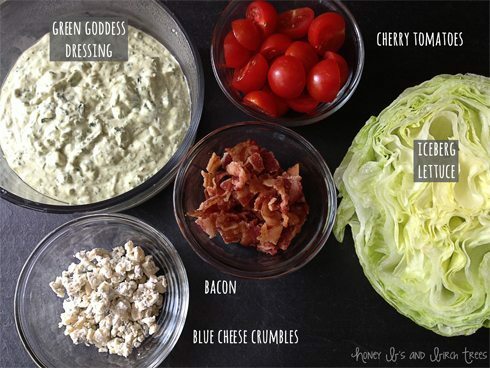 I’m on a wedge salad kick lately, and this one looks delicious! Thanks for sharing on FoodieFriDIY! 🙂 I can’t wait to try it. I had no idea green goddess dressing was so easy to make! I’m pinning this one for sure and making soon. Thanks so much for sharing this recipe. Hi thanks for sharing this awesome recipe at INSPIRE ME MONDAY. Just to let you know I will be featuring your recipe at this week’s party. I hope you come by and share again this week at 9:00 a.m. EST at http://www.farmhouse40.com/inspire-me-monday-74/ Hugs!!! This recipe looks wonderful! Thanks for sharing it at Craft Frenzy Friday on Mom Home Guide! I can’t wait for Spring, now! And my fresh herbs! Thanks for bringing this by Throwback Thursday last week! Yummy! Thanks for sharing at the Inspiration Spotlight party! Pinned & shared. I thought I was safe, since I JUST finished dinner, but nope. I want this right now. Thanks for linking up at Saucy Saturdays.